River City Wrestling trains athletes in the Louisville, KY metropolitan area in the sport of folkstyle wrestling, the type of amateur wrestling practiced in high schools and universities in the United States. 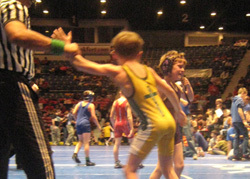 We offer two programs at different times of the year, and wrestlers are grouped by age, weight and experience. All practices are in the upstairs gym of Saint Xavier High School unless otherwise noted. See the calendar for specific dates. All participants in any of our programs are required to have USA Wrestling Insurance. When registering for your card, please be sure to select Get and find River City Wrestling as your club. If you have never wrestled for a program before you will create a new account. If you are returning member you will log into your account that already exists. Go to the USA Wrestling Membership page now to get your USA Wrestling Card! October. Check the CALENDAR for specific days and times. Click on each event in the calendar for more details. Our Rookie Camp is designed to be an introduction to the sport of wrestling and the River City Wrestling program. Who: Kindergarten through 8th graders. Cost: $60. This fee is applied to your registration fees if your wrestler decides to participate in the full program. Insurance: All wrestlers must have a USA Wrestling Card for insurance purposes before being allowed to practice. Go to www.usawmembership.com/ create an account and purchase your card. When creating an account with USA Wrestling, be sure to list River City Wrestling (in Kentucky) as your club. Use the button below to get to our registration page. You will also need to print and sign the USA WRESTLING MEDICAL RELEASE. Bring a copy of your wrestler's birth certificate to the first meeting or practice that you attend. Please be sure to complete the registration form above for each wrestler in addition to making payment below. Contact Coach Quirino if you need to make payment arrangements. When you click the Payment button you will be redirected to our store that uses Square for card payments. Go to the USA Wrestling Membership page to get your USA Wrestling Insurance Card! Be sure to find River City Wrestling by clicking "Get Club." October through February. The season begins with a Rookie Camp in October and concludes with the Youth and Middle School State Tournaments. Practice groups will be determined based on age, experience and work ethic. Assessment of wrestlers will take place at the beginning of the season and throughout the year at practices. Wrestlers practicing with either the White, Green or Gold Team should anticipate practicing with the same team at the beginning of the next season. Wrestlers will be assessed during practices and may be moved to another group at any time during the season. Click on each event in the calendar for more details. Cost: Varies according to group. Sibling discount codes are available. Click the "Pay via Square" link below for pirces and discount codes. Kindergarten group includes: team shirt, 1 practice per week, and a wrestler's gift at banquet. White Team includes: team shirt, 2 practices per week, use of singlet, entry to tournaments, and a wrestler's gift at banquet. Green and Gold Teams include: team shirt, 3 practices per week, use of singlet, entry to tournaments, and a wrestler's gift at banquet. Late March/Early April through May Aavailable to wrestlers 5 years and older. Check our CALENDAR for practice days and times. Click on each event in the calendar for more details. Who: Kindergarten through 12th graders. This is a good place for new wrestlers to begin and for experienced wrestlers to get extra training. Experienced wrestlers will take part in a Freestyle and Greco training camp that will conclude before the Central Regional Tournament. Middle School and High School wrestlers will have the option to participate in a Strength Training Program. Workouts for this program will vary based on the needs of the individual. The program covers all levels from beginners learning proper form to advanced/ experienced athletes looking to make stregth gains. Beginners in grades K-6 also have the option to participate in our 4 week Beginner Program which will serve as an introduction to Wrestling. This group meets once per week for 4 weeks. Check the calendar for days and times. Wrestling Only: $160 per wrestler plus the cost of your USA Wrestling membership card. Beginner Program (4 weeks): $40 per wrestler plus the cost of your USA Wrestling membership card. Registration: Complete the REGISTRATION FORM you will also need to print and sign the USA WRESTLING MEDICAL RELEASE.